ABOVE THE FRAY cord organizers are hand fashioned with vegetable-tanned leather. It’s an environmentally friendly process that creates rich, natural hues and leaves leather soft and supple. PowerPlay protects your MacBook power brick against scratches while keeping those thin cables rolled up and stashed away, never again to unravel in your bag. Everyone asks, "Where did you buy that?" "At The Grommet". Great problem solver. Such a great helpful product! Works well. No more tangled cords. Elegantly organize cord chaos with handcrafted leather bobbins by ABOVE THE FRAY. Wind earbuds and MacBook cords around, and they stay snug—easy to carry, use, and store. The top grain leather is vegetable tanned, creating rich, warm colors from earthy elements like vegetables and bark. Gentle on the environment, the process retains the leather’s ingrained markings while it becomes soft and supple with use. Founder Achara Masoodi is a self-taught designer who empowers independent artisans in Bangkok. ABOVE THE FRAY selects each individual hide, then cuts the shapes out on a hand-powered machine in a decades-old Bangkok workshop. They finish each piece by hand with a beeswax burnish. The earbuds organizer is light enough to stay attached when listening to music. 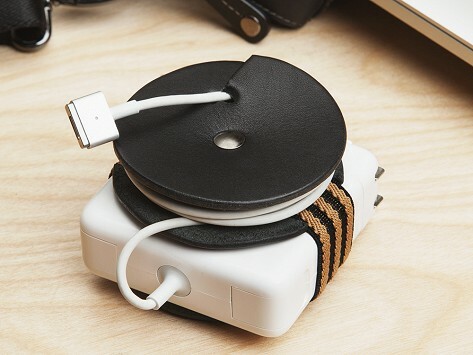 And the PowerPlay smartly organizes the cord and heavy brick on MacBook chargers. It helps prevent scratching, and because the leather is breathable, you can keep the charger inside even when it’s plugged in. By cleverly combining traditional craft and modern function, ABOVE THE FRAY’s designs will fit flawlessly into your everyday life.